“A homeless man approached me one day asking for money to buy food. I would have given him some, but I did not have my wallet on me,” says Middle-Years-Programme (MYP) student Valentin Stelea. It’s a moment that encouraged Valentin, from Atlanta International School, US, to create ‘Food Flip’. Food Flip is a not-for-profit organization, which started as a Personal Project. It aims to reduce food waste in the local area and provide provisions to those in need. 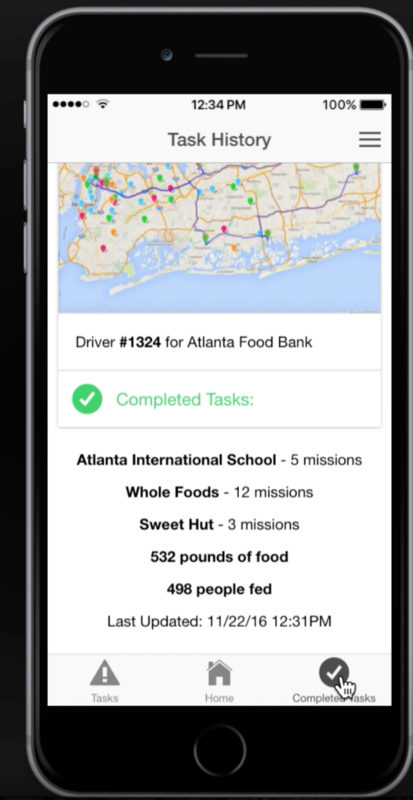 Businesses can donate food via the Food Flip website or the iOS app, which Valentin created. Restaurants, bakeries, schools and supermarkets log the food or produce they are about to throw out. Once the food is logged, it is picked up by a local food bank – or any food organization that is collecting, storing and spreading food to people in need. Around one in seven people in the area goes to bed hungry, according to Atlanta Community Food Bank. To date, Valentin has helped feed 110 people. Since completing his Personal Project, Valentin has found it difficult to encourage corporations to work with him. But that’s not stopping his quest to end world hunger. Valentin hopes to work full time at Food Flip after college. He wants to expand the approach to other states and eventually take it global. “I want people to see Food Flip as not just a company, but as an ideology and state of mind. Anyone with a dream can make a positive impact on the world. This article is part of a series of stories from IB World magazine that bring to life the wonderful initiatives undertaken by IB students and educators from around the globe. Follow these stories on Twitter @IBorganization #IBcommunitystories. Share your great stories and experiences: email editor@ibo.org. Who said sugar-free desserts weren’t sweet?